There are some 28 species of worm found in UK soil of which only four are of the casting variety. They are surface feeders and the ones that can spoil a fine lawn. 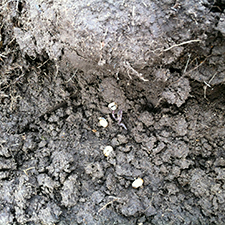 Casting worms do aerate the lawn but can also cause extensive disruption to the surface. 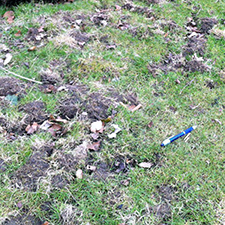 Burrowing animals such as moles and badgers can destroy huge areas of turf in their search for worms. 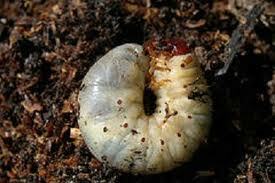 If requested we apply a worm suppressant which dissuades casting worms. Normally this works well with one annual application. The regulation on the use of pesticides in lawn care is tightly controlled by legislation, which means that the application of professional pesticides and herbicides can only be done by trained operators who hold the NPTC certificates. This ensures that all applications are done safely without harm to people or the environment. Brilliant Lawns spray technicians are fully trained and certificated in accordance with Government legislation. Chloropidae is the family of flies that are known as Frit Flies or Grass Flies. 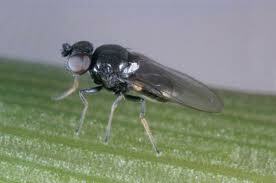 These small flies are usually black or yellow in colour and, as their name suggests, often inhabit grass areas. In spring the larvae can destroy the central stems of turf grasses such as bents, fescues and ryes. Sometimes there can be large infestations and these can cause significant areas of grass to turn yellow. 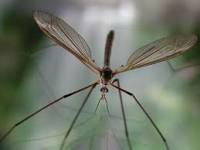 Leather-jackets are the larvae of the Crane Fly, commonly known as Daddy Long Legs. They attack grass plants at or below ground level which then die off rapidly. Over winter damage becomes visible in the spring. They make an attractive meal for crows which peck quite large holes in their daily search for food. 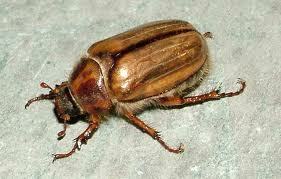 Chafer grubs are the larvae of the chafer beetle and they feed on the roots of grasses and other plants. Infestations can be very localised and sporadic and usually occur between autumn and spring. Areas of lawn might become yellowish and considerable damage can be done by crows, foxes and badgers feeding on the grubs. If you suspect that your lawn has an infestation please contact us. We will investigate and apply a suitable treatment as required.